I can modify both logging code and code that reads user input. 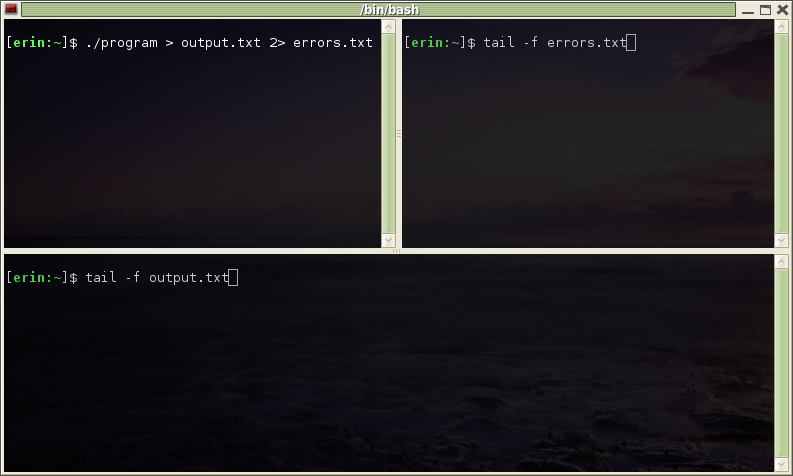 Want that to work for Linux and OS X. log() function could be invoked from different thread. The log() function is the only writer to stderr. Other suggestion to fix that problem (spoiled input line) are welcome. I'm looking for a solution that could be implemented without additional libraries (like Curses). I tried to google that up, but realized that I need a sort of idiomatic kickoff to understand what exactly I want. Thanks to Jonathan Leffler comment I realized that I also should mention that separating stderr and stdout is no that important. Since I control the log() function it's not a problem to make it write to stdout instead of stderr. No sure whether it makes the task easier or not, though. Любой ввод программы набирается в консоли: # 1 . It partitions off the bottom line for user input and outputs everything to the line above it. It also provides a configurable prompt and even has functions to record a typing history for the input. This simple example just reverses everything you type at the console. Below is the final solution that I came up with. It's actually a working example that spawns N threads and emits logs from each of them. Meanwhile interactive user is allowed to enter commands. The only supported command is "exit", though. Other commands are silently ignored. It has two minor (in my case) flaws. The reason for that is VREPRINT control character that also emits a new line. So I didn't find a way how to reprint the current input buffer without that new line. Second is some occasional flickering when symbol is entered in the same time when log line is printed. But despite that flickering the end result is consistent and no lines overlap is observed. Maybe I will figure out how to avoid it later to make it smooth and clean, but it's already good enough. Not able to use 7-Zip to compress stdin and output with stdout? How to combine array with dynamic input? how to crop with node-imagemagick, with a buffer as input, and stdout as output? Why the selection mechanisms of RecycleView doesn't work when pressing mouse above complex widget (containing some sub-widgets)? How can I override doze mode while the device is moving? How do I implement an EFContextProvider using BreezeJS for .net core?